The dramatic painting on page 1 of this issue is the creation of Gerald Reis, an artist working from his studio in Yorkville, California. His approach to art and design combines classic images with a contemporary bent giving his work an unadorned attractive simplicity. His graphic art has won numerous awards in competitions and has appeared in several prominent publications. He has been included in many exhibits including the San Francisco Museum of Modern Art and many of his works are part of the permanent collections of the Library of Congress and San Francisco Museum of Modern Art. Gerald also creates identities and product packaging for restaurants, retail stores and major corporations. 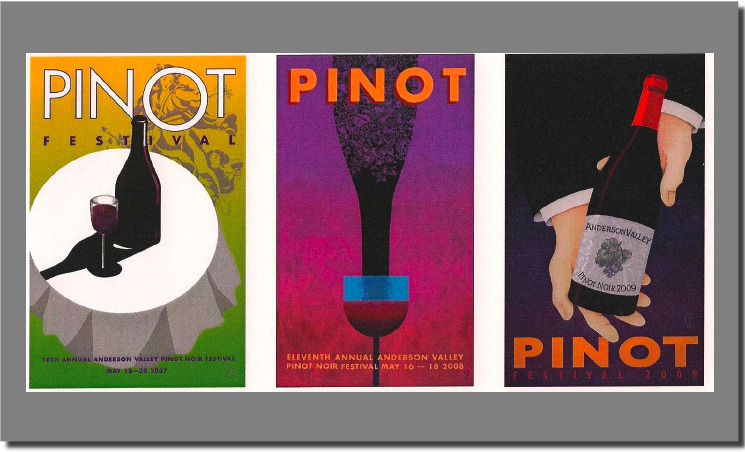 Gerald has created original art to commemorate wine festivals in the Anderson Valley and Yorkville Highlands. Prints of the original paintings are available for purchase from the artist. Each print is reproduced from the original on fine archival paper through a high quality printing process called Giclée. Phone Gerald at 707-894-0777 or e-mail him at gerald@reisdesign.com. The website is www.reisdesign.com.